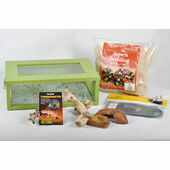 Free Bearded Dragon care sheet with this product. 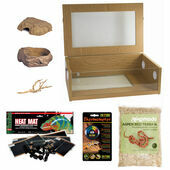 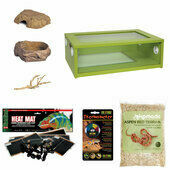 Designed to provide those new to reptile keeping with everything they need to ensure that their new pets will be happy and healthy, this beginner bronze Bearded Dragon Starter Kit is available with one of three finishes and also includes a few handy accessories in addition to the must-have essentials. 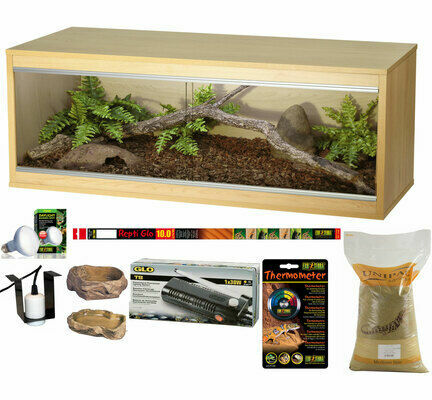 1 x Vivexotic Repti-Home Large Vivarium - Easily assembled reptile habitats with sliding glass doors that can be safely stacked on top of other similar sized units. 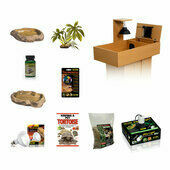 Perfect for owners with multiple reptiles. 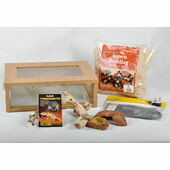 Size: 1150mm x 375mm x 561mm (WxDxH). 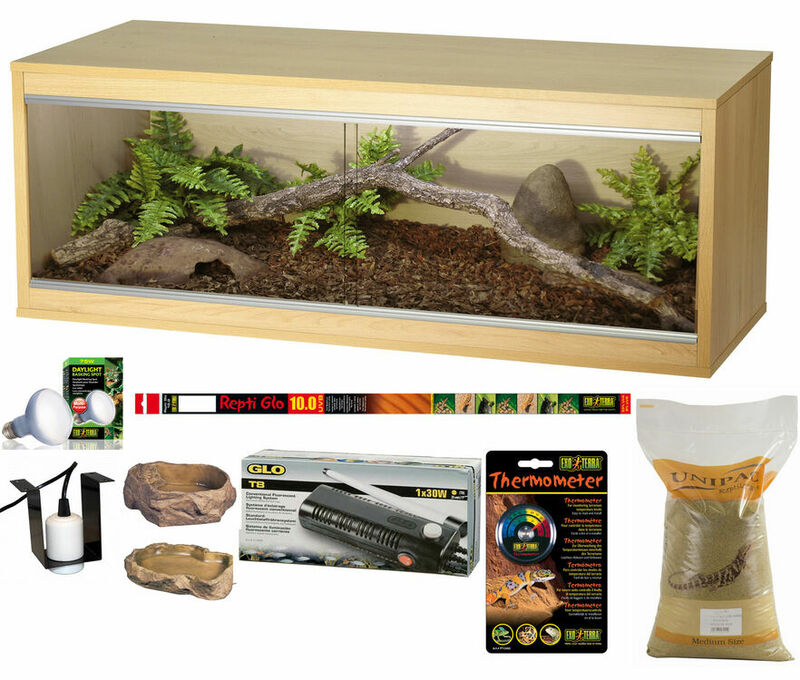 1 x Exo Terra Reptile UVB 150 Desert Terrarium 25w Bulb (PT2396) - Ideal for Bearded Dragons, Horned Lizards, Desert Tortoises, and other reptiles with very high UV requirements. Exo Terra Daylight Basking 75w Bulb (PT2132) - Emits UVA light which helps to keep plants and reptiles healthy. 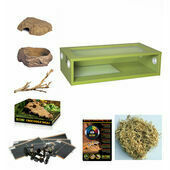 1 x Exo Terra Reptile Feeding Dish (PT2811) - A hygienic, easy-to-clean bowl designed to look like a natural rock formation. 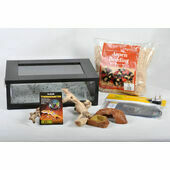 1 x Exo Terra Reptile Water Dish (PT2802) - A non-porous water bowl with steps to prevent pets from potentially drowning.  1 x Komodo Ceramic Es Lamp Fixture & Mounting Bracket (82303) - An easy and secure means of installing heat or light lamp bulbs. 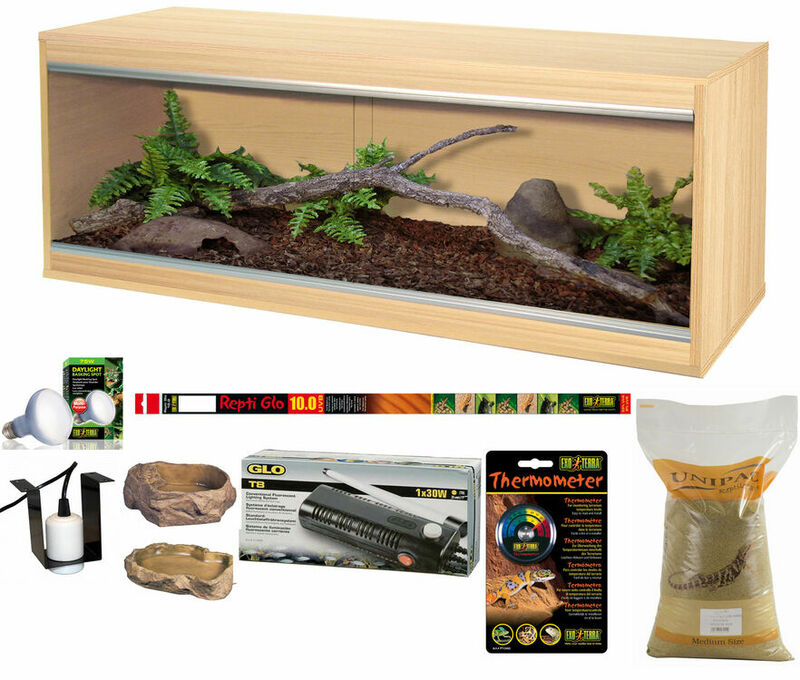 2 x Exo Terra Dial Thermometer (PT2465) - Easy to read and provides temperature readings in both Fahrenheit and Celsius. 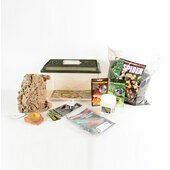 1 x 12.5kg Unipac Natural Reptile Calcium Sand Substrate (PRSA12A) - Suitable for reptiles of all species, this Calcium Sand is all natural and helps reptiles remain clean and parasite-free. 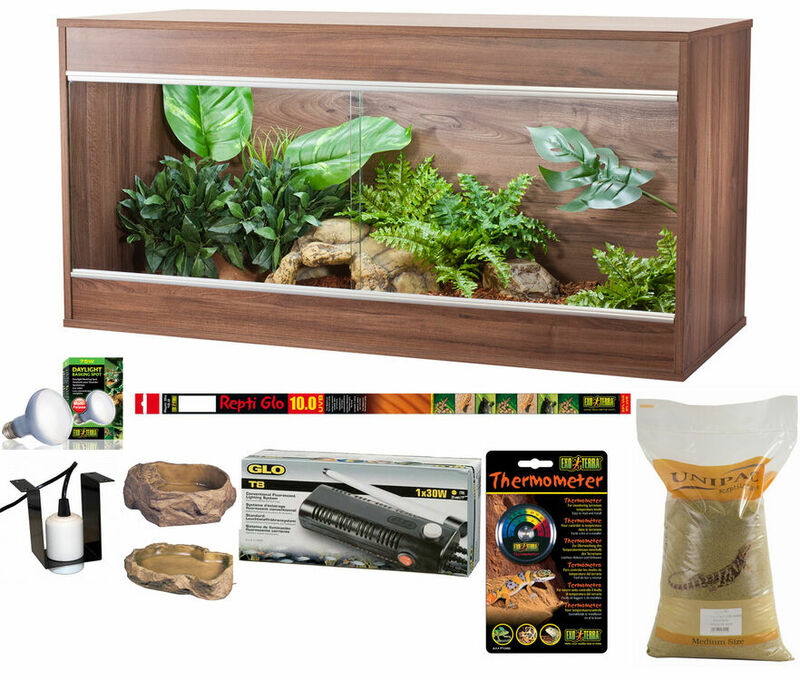 The Vivexotic Repti-Home Large Vivarium is available with one of three finishes for you to choose from; Beech (PT4052), Oak (PT4074) & Walnut (PT4075).